Almost a year ago, we travelled to Chicago for the first time. We were visiting some friends from college and we packed in as many activities as possible in three short days. We went to the art museum, saw an MLS game, had the classic pizza. But my favorite part of the trip was when we visited Bang Bang! Pie and Biscuits and it was a religious experience wrapped in buttery crust and flaky biscuit dough. Their basic premise is this: pie and biscuits. So simple. But they gussie up their treats to be savory and sweet and seasonal and they also have staples that are always on the menu. I got a mixed berry pie with streusel topping and a pasta and sausage hand pie (!!) with pickled onions on the side. We arrived early and there was already a line forming outside and around the block. To accompany the top notch food, everyone who worked there was so kind, and they greet you with such excitement! It was really hard for me to refrain from asking them to be my new best friend and disciple me in their pie and biscuit ways. bang bang pie and biscuits! After our trip, I became like a woman obsessed with pies. Who else out there is baking delicious pies, and how do I get to them? Enter: the Elsen sisters. A recent family vacation took us to New York City, which meant I had to visit Four and Twenty Blackbirds. Four and Twenty Blackbirds (that name!! so cool!) is a pie shop that opened in Brooklyn, New York in 2010. It was started by two sisters who grew up eating delicious home baked goods (specifically pies) hand crafted by their grandmother and other matriarchal family members. They both left non-baking careers to bring about a wildly successful pie shop to one of the most influential cities in the world. They also published a cookbook in fall of 2013, and it became an instant favorite in my cookbook library. I dove into their writings and recipes and started a pie baking frenzy, which eventually morphed into the dream of opening my own pie shop. Of course it wouldn’t be anything hard to open a pie shop of my own. People open restaurants all the time! No way did it matter that I didn’t have any restaurant or professional baking experience! Nor did it matter that I didn’t have any extra cash to open up a restaurant, because how much do you really need anyway? All of these were minuscule details, enforced by two positive eating experiences and a deep need to flex my own creative muscles. Spoiler alert: This is NOT about my plans to open up a pie shop. After reading Delancy (which is lovely and endearing), I was equal parts inspired and terrified to start a restaurant venture. (Molly paints such a sweet picture of their restaurant, though, are you guys hiring people with no experience? haha) Plus: hello reality! Starting a small business takes waaaaaayyy more capital than I happen to have laying around. However, like the Elsen sisters, I’ve wavered from my original career path and to find an outlet in cooking and baking. I’ve found the satisfaction that comes with a clear start and finish, tread weary line between scientific perfectionism and artistry, and experienced the loving friendship that develops when you share the food you make with others. So the next chapter in the pie chronicles has lead me to food blogging. It’s an outlet to keep me creatively accountable and push my limits of trying new things. Here I hope to share recipes that I’ve found to be delicious and simple, along with a few originals. We usually eat whole, nutritious foods at our house, which I know looks different for everybody, but I think I can safely say that doesn’t include daily doses of pie. I’m attempting to make this a creative space, to share food ideas and make new friends who love creating food and the ways it can bring people together! I’ll try to provide an honest picture of what our food life actually looks like, which means there won’t be just pie, because man cannot live on buttery crust alone (sigh). Having said that, before we segue into the world of whole eating, here is a recipe from the Four and Twenty Blackbirds cookbook, that I modified and made patriotic for the recent 4th of July holiday. (I’m actually going to attempt to bake my way through their pie book, and I’ll record most of my attempts here, so pie will actually be a recurrent theme) I’ve made it several times, and this is my first adaptation from the original recipe. This is one of the pies we sampled while in NYC, and I can happily report that it tasted just like the ones I’ve made at home. Their cookbook feels really thorough, their recipes seem to have been tested into perfection, without being so complicated that a beginner can’t bake from their writing. I added a streusel topping instead of the traditional lattice crust topping, and then added star shaped pieces of pie crust to the top, because why choose when you can have both? It was a hit, and my husband had the leftovers for breakfast the next day, and for the dessert the day after because apparently : “it’s a holiday”. Roll out half of one batch of all-butter crust to about 1/8 in thick, and line a 9-inch pan with the dough. There should be a generous amount of dough hanging over the sides of the pie pan, at least 1 inch all around. Combine 1 teaspoon all-purpose flour and 1 teaspoon granulated sugar, and sprinkle on the bottom of the crust. This is a neat trick from the Elsen sisters, it helps keep the bottom of the crust from getting too soggy with fruit pies. Refrigerate the crust until needed. Roll out the second half of your dough into 1/8 inch think. Cut into any shape you desire, I did a variety of star shapes. If you have any leftover pie crust, you can do this to it. Set aside. Whisk the water and sugar together in a medium saucepan and cook over medium heat until the sugar is dissolved. Add the butter and simmer (a slow, rolling boil), stirring occasionally, until it turns a deep, golden brown. Remove from the heat and slowly add the cream while whisking – careful, it will bubble and steam. Whisk well, and then stir in a pinch of kosher salt. Stir together the first 4 ingredients in a large bowl. Add the butter and mix/mash with a fork, then work together with your hands. The butter should be well incorporated throughout. Chill until needed. Preheat your oven to 400 degrees Fahrenheit. Place your oven rack in the bottom position. 1 egg + 1 tablespoon water, whisked together. Core, peel and thinly slice your apples. (or! use this handy machine! it also does potatoes!!) Toss the apple slices in a large bowl with the lemon juice and 2 tablespoons of sugar. Set aside the apples, to soften and release their juices for about 20-30 minutes. Drain the excess juice before continuing. In a small bowl, mix the raw sugar and spices together. Gently fold the spice mixture into the apples. Next, spoon the apples into the prepared pie crust. Press down with your hands to tightly pack in the fruit. 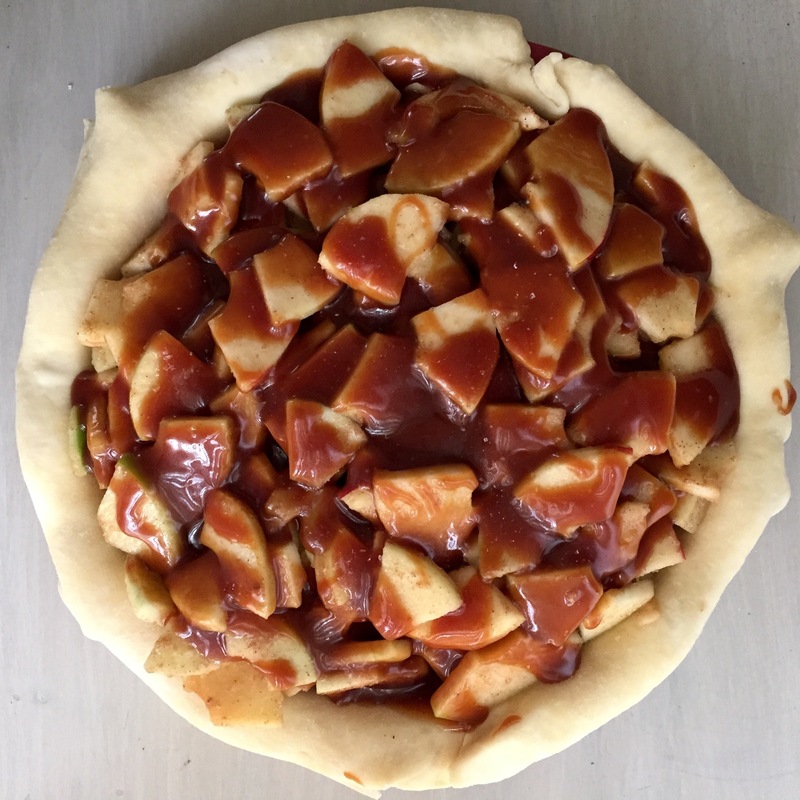 Pour 1/2 to 2/3 cup of the caramel sauce over the apple mixture. Add your streusel topping and press down, packing the streusel into the fruit. Crimp the edges of your pie dough, using this technique. From here you can add your star dough to the top, or whatever shape you used. Brush with the egg wash (self tanner for dough). Sprinkle the tops of the stars with extra raw sugar. Drape a piece of tin foil over the pie(this keeps the crust from browning too quickly). Place the pie plate on a rimmed baking sheet, and bake for 20-25 minutes (it took 25 in my oven) then turn the oven temp down to 375 degree F, remove the foil, move the pie to the center of the oven, and bake for 30-40 more minutes, until deep golden brown and the pie is bubbly and some of the juices are trying to escape. The apples should be tender, but not mushy. Allow the pie to cool for at least 2-3 hours before cutting. This will help keep the filling in each piece of pie and give structure to your slices. This will keep at room temp for 2 days, or in the fridge for 3, or so I hear.